Congratulations to Peter Higgs and Francois Englert for receiving the Physics Nobel Prize of 2013, for proposing the Higgs Boson that was announced at the LHC at CERN on July 4, 2012. 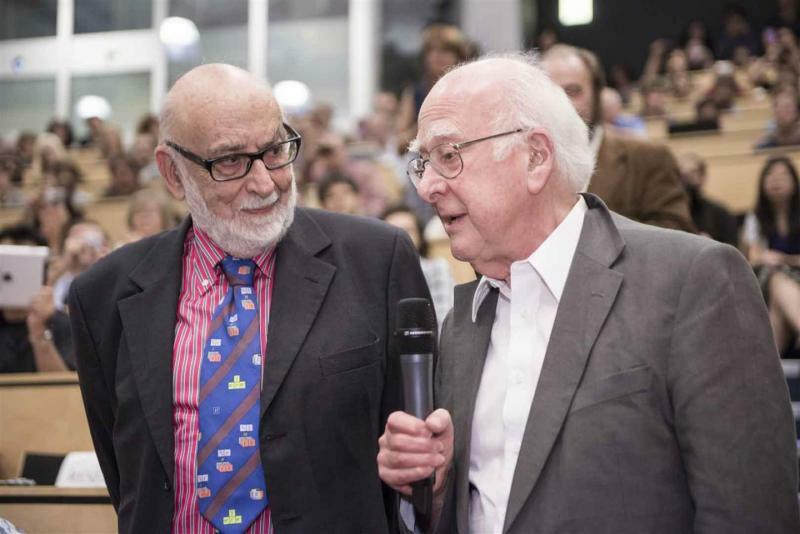 Francois Englert and Peter Higgs at the Higgs Particle announcement at CERN (photo from Maximilien Brice /CERN) . Kudos also to fellow proposers of the Higgs: Robert Brout (Englert co-author deceased 2011), Gerald S. Guralnik (Brown U. ), Carl R. Hagen (U. of Rochester), and T. W. B. Kibble. They could not all be recognized because of the rules on the Nobel Prize. The American Physical Society (APS) has an announcement that covers the contributions of all as winners of the 2010 APS J. J. Sakurai Prize. This entry was posted in Higgs Boson, Particle Physics. Bookmark the permalink.